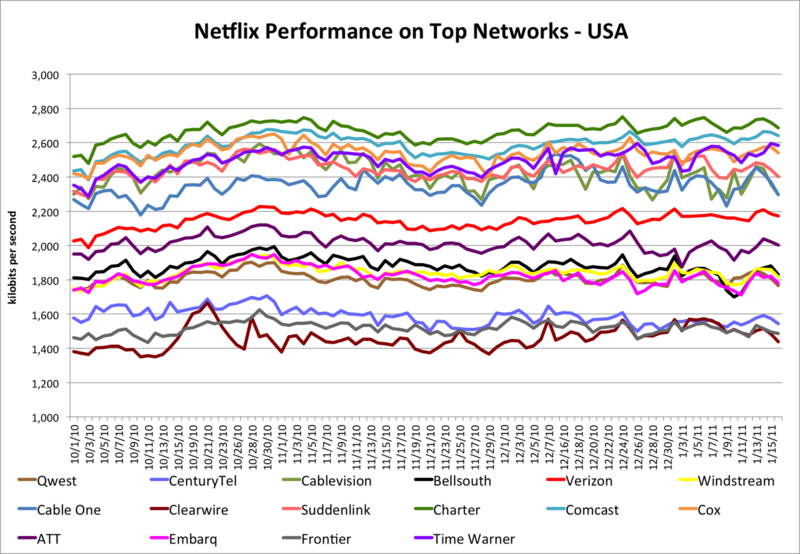 Hacking NetFlix : Netflix Shares ISP Performance Data - How Would Your Rate Your ISP? Pleased to see where Comcast (my ISP) is on this chart, which'll serve as an interesting baseline should 'Net neutrality issues arise after NBC is in the house. I too am a Comcast customer who is happy to see my ISP having done so well, both against the other big dogs as well as the smaller companies. I continue to see Comcast as a vaguely innovationless Big Brother who takes care of me... until the day comes that they really show their evil selves. Anywho, kudos to Netflix to releasing this information and starting the debate. I am really surprised Charter is at the top of the list. I guess best of the worst fits. I don't know what to make of my situation. I have Comcast high speed as well. Speed tests consistently show 20+ mbps yet I suffer sporadic buffering w/ NF. It happens during peak and off peak hours, wired and wireless connections and on three different devices (two Sony and one Samsung BR players). Weird thing is it will occur with one HD program and switching to another HD program plays just fine. I was nearly convinced it was a Comcast issue, but now I'm starting to think it's either NF server issues or lousy software on these players. Funny thing is a friend has Quest DSL (much slower speeds) and the same Sony S570 BR player and he has none of these issues. I think my next move will be to get another Roku. Never had issues when I used one a couple years ago. It's exasperating troubleshooting this problem. I'm on Frontier, i'm not surprised it's not amongst the top, but am a little surprised it's that close to the bottom. I probably shouldn't be, because i pay about half of what Comcast's lowest package in my area is. I rarely have problems streaming and the quality is around DVD most of the time with no lag/interruption problems that i can recall being of any consequence. These graphs have little to no practical significance in quality of broadband provider. I am astonished that Charter is in the lead. I've used Comcast, MediaOne, Mindspring, uVerse, and Charter, and Charter was the worst by such a distance that we considered contacting the Better Business Bureau. Maybe they're somehow magically better outside of Georgia. What do these graphs actually represent?? The speeds available??? The quality (latency) of the service s provided??? Or do they represent the average speeds the customers on those systems subscribe to?? I found my provider (Qwest) near the bottom of the list. I've been with them a long time and know that although they provide 768k DSL services (SLOW), the majority of their subscribers are still subscribing to services running between 1.5mbps and 3mbps. I use my internet a LOT for a variety of things which includes DirecTV video on demand and Netflix. Since I do, I was running 12mbps service....when I installed a couple more Netflix enabled devices in my home I bumper my service up to 20mbps so that I could handle multiple HD streams without buffering. Also had to upgrade my home wifi from G to N so that a wifi enabled Blue Ray player I had upstairs could play Netflix HD without buffering. The "problem" is that a lot of people either can't afford internet speed service higher than 1.5mbps, maybe 3mbps....or they just don't have it available to them (especially in rural areas). I would tend to believe the charts reflect much less the quality/capabilities of the providers and much more the speeds/services the customers subscribe to. I have Time Warner just north of LA. Most of the time it's pretty good service, but it's more or less unwatchable from around 8-10 at night. I have Road Runner Turbo (15 Mbps), but good luck getting that at those times. I'm hard wired into my Sony 570 btw. Did you bother reading the article? It explains thoroughly what the graph represents. too bad i'm color blind, i have no idea what the ratings are. Yes I did.......that's why I asked the questions I did. Are you capable of understanding what I asked, or answering the questions???? I have ATT DSL 3Mbps down speed, level of service. For whatever reason Nf will only stream at a top speed of 1.5Mbps down. I have 4 dot (best quality on Roku) SD Roku quality 99% of the time. I've had no problems to speak of in a year of Roku streaming of Nf and am very happy with my streaming results from such an inexpensive broadband connection.